Young is a rural town located in the heart of the Hilltops Region of NSW. Located just under a two hour drive from Canberra, it is probably best known for the cherries it produces. But don’t think that cherries is all this lovely town has to offer. There are now vineyards and olive groves as well as a variety of other fruit orchards. The area also has a rich history so you will find loads of things to do in Young. Young was first settled in 1830 after James White arrived in the area. Sheep farming was the predominant activity at that time. In 1860, gold was discovered by Whites nephew and within a year, there were 20,000 miners in the town. At least 2000 of these were Chinese. The European miners did not like the Chinese being there and riots were a frequent occurrence. The Chinese heritage of the area is still celebrated today. The former Young Railway Station is now home to the Hilltops Region Visitor Information Centre. This is a great way to still make use of this beautiful building that dates back to 1885. Here you will find plenty of information on both the local and surrounding areas. Arts, crafts and local produce can also be purchased here. It is also home to the Hilltops Regional Wine Cellar which offers for sale a selection of the regions wines. Just opposite the Railway Station is a lovely shady park as well. There is also plenty of parking available. 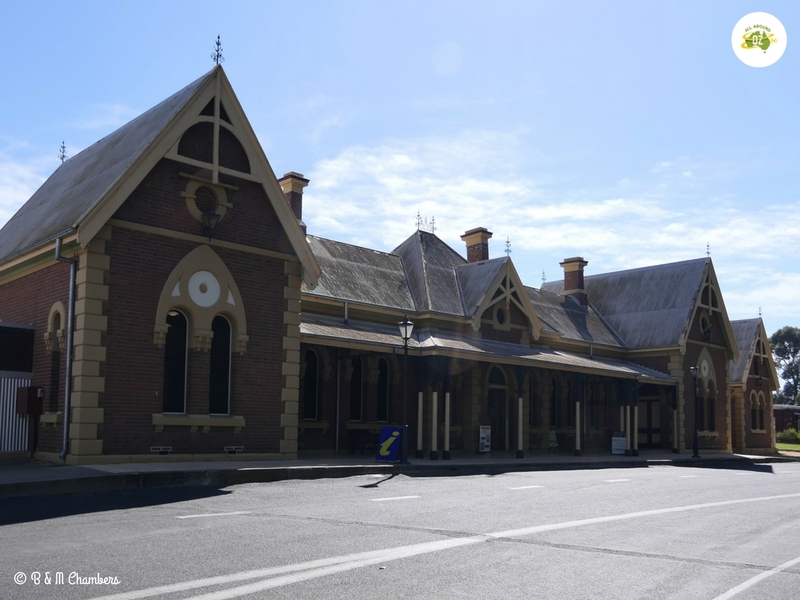 The historic Young Railway Station is now the Visitor Information Centre. Chinaman’s Dam was built in the 1860’s, to provide water to the gold fields. It was also used to obtain water for steam locomotives between 1885 and 1901. In 1992, Young Rotary Club began a project to improve the facilities at Chinaman’s Dam and also to establish a Chinese Garden. The Chinese Tribute Garden was established to recognise the contribution of the Chinese to the settlement of Young. Today the Garden’s are a lovely area of Young to enjoy a picnic or barbeque or to simply stroll around. The traditional Chinese entry gates were originally part of a panda display at Taronga Zoo. The Chinese Tribute Garden at Young is a lovely spot for a picnic and a stroll. If you want to learn more about the history of Young, then a visit to the Lambing Flat Folk Museum is a must. It is located in the 1883 school building. There is a display devoted to the Gold Rush and the Gold field riots. It was after these riots that Lambing Flat was renamed Young. There is also plenty of other interesting memorabilia housed in the Lambing Flat Museum. After you have finished your visit, you can grab a bite to eat at the popular Kettle & Grain Café which is located just behind the Museum. Young is starting to gain quite a reputation for producing a great array of food. We weren’t looking for anything to fancy on the day we visited so we decided on a pub lunch. The Aussie Hotel was recommended to us by local friends and let me tell you, it did not disappoint. 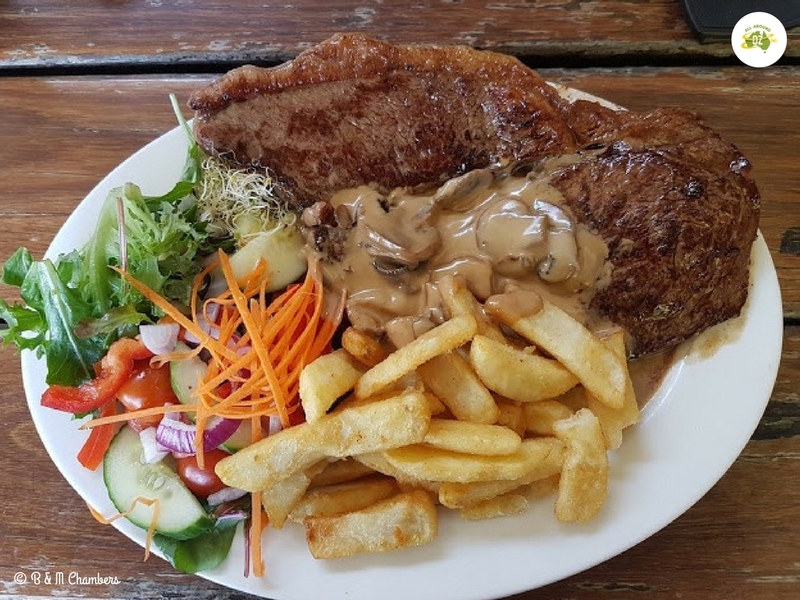 I had a rump steak with salad, chips and mushroom gravy. The steak was massive and covered almost the whole plate. It was also beautifully cooked – tender and juicy! The chips were crispy and the salad fresh. Brenden had a massive Chicken Schnitzel with Hawaiian topping which he said was delicious. All this cost us $38.00 which we thought was very reasonable. If you just want to grab something quick, then Wilders Bakery, located in the main street produces the goods! This was the huge meal I enjoyed at the Aussie Pub in Young. Just a few kilometres from Young near the tiny village of Greenethorpe is the stunning Iandra Castle. Open only a handful of times during the year, it is well worth making sure you time your visit to coincide with Iandra’s Open Days. Also nearby is the small town of Boorowa, famous for it’s Irish Woolfest. Just an hour’s drive north-east of Young is Cowra, famous for it’s Japanese Gardens and former WWII POW Camp. 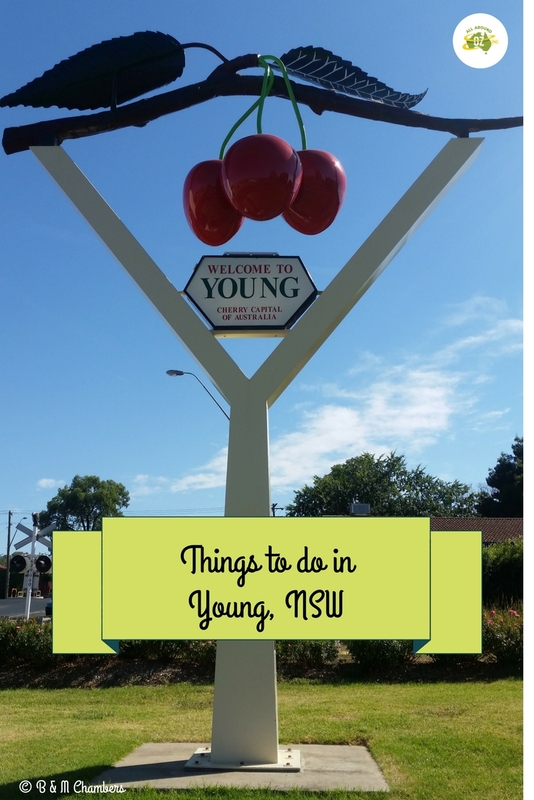 Hilltops Region Tourism – A great time to visit Young is during the annual Cherry Festival. It’s on in 2018 from 30th November to 2nd December. Having just returned from a caravan trip up the Newell Highway in Central NSW I have a new found appreciation of these types of little country towns. They all seem to have something special. Young looks like another little gem to be discovered. We love all these little country towns. So many of them have so much to offer.